Jackie Robinson made history when he debuted in major league baseball in 1947. This volume recounts Robinson’s story as a pioneer of civil rights and explores how and why the racial integration of professional baseball profoundly affected American society and culture. 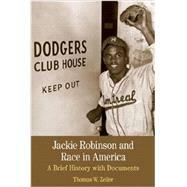 The introduction places Robinson’s trailblazing achievement in the historical context of U.S. race relations. A rich collection of primary sources includes the voices of the black press and community as well as those of white commentators to reveal the range of responses to the integration of America’s "national pastime." Illustrations, document headnotes, a chronology, questions to consider, and a bibliography enrich students’ understanding of Robinson and race in America. Thomas W. Zeiler (Ph.D., University of Massachusetts-Amherst) is professor of history at the University of Colorado Boulder, where he teaches American diplomatic history, modern U.S. history, World War II, and American history through baseball. His works include Free Trade, Free World: America and the Advent of GATT, Globalization and the American Century, Annihilation: A Global Military History of World War II, and Ambassadors in Pinstripes: The Spalding World Baseball Tour and the Birth of the American Empire. He is editor of the journal Diplomatic History and a past president of the Society for Historians of American Foreign Relations. 35. Letter from Jackie Robinson to Malcolm X, November 27, 1963.